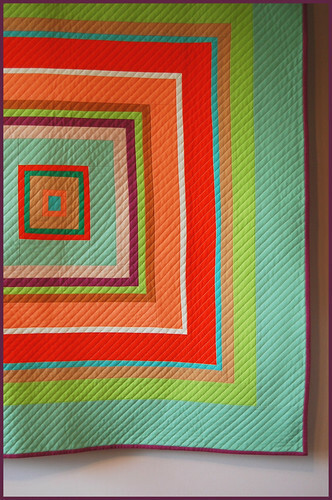 ...and here's the other little quilt i managed to get a photo of...my own version of malka dubrawsky's fish baby log cabin quilt. i also pieced this one back in our connecticut days (sometime in 2011), but didn't get around to quilting it until this summer. i wanted the color scheme to be really jarring, with a lot of clashes, and value changes. i tried to use colors i don't always use (like purple and brown, which are some of my less favorite hues). 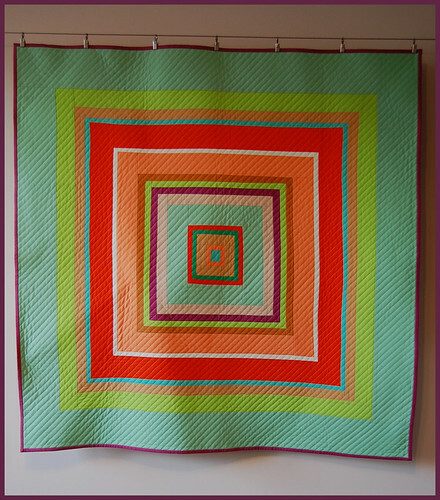 someday, when i am so inclined, i want to make four of these puppies and merge them all into one big mama sized quilt, but maybe mix up the order of the colors on each one, or make one completely different for visual interest. hmmm, idears!